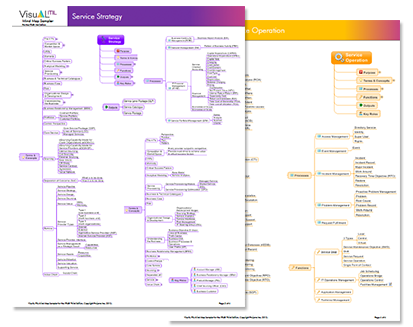 VisuAL ITIL (Visually Assisted Learning for the Information Technology Infrastructure Library) is a suite of products that apply color, graphics, and interactivity to represent the relationships between the processes, functions, role and outputs in a visual manner. The graphical presentation allows you to see the associations. Experience the ITIL® with VisuAL ITIL. A VisuAL Mind Map that utilizes of graphical images and color to help you to make a mental image of the relationships. Explore the concepts and terms associated with each process area. Available as a PDF for you to print at home or use with your laptop or tablet on the go.